There are several quite brilliant things about the production of Where The Wild Things Are at Young People’s Theatre, but among them, the most reassuring to me as a parent was this: there are no monsters. No external monsters, anyhow; in the story, all the Wild Things are played by the audience. By the time Linda A. Carson (in a dual role as Max’s mom and Our Narrator) is instructing the children to scare their own toes, everyone’s located and made some peace with their inner Wild Things – which is, of course, the whole point of Sendak’s original book. With a relatively simple, whimsical staging and a lot of audience interaction and participation, Where The Wild Things Are is honestly the best littlest-kids show I have ever seen. Carlson and counterpart Raes Calvert both tell and enact the story, interacting naturally with the children (even the smallest ones) and yet still keeping the story on track. The production assumes at least mild familiarity with the book, though I wouldn’t think much is lost if it’s an entirely new story. Some of the action – like Max’s insistence that vines have to grow all over his bedroom – are a bit more fun if you understand he’s trying to make the scene match the book. Carlson pauses the action frequently to encourage the audience to share thoughts about Max’s feelings, motives and reactions to things in the story, and the effect isn’t at all saccharine or false: Carlson comes across as (and one suspects, genuinely is) really interested in what the children imagine in their early attempts at empathy. It’s nice stuff. Calvert, as Max, is made of superballs and puppy toes and fizz, and seems like a big kid playing a somewhat littler kid (which, I suspect, he is). I always worry when grown people play children, but Calvert has an innate kid-ness to him that he seems to be more accessing than “performing.” Regardless, it works. His Max is as mercurial as any five-year-old, moving from the proud puffery of King Max to a small human who has just remembered how much he misses his parents in an eyeblink. More than anything, this is somewhere between souped-up storytelling and full-fledged theatre – which I intend as a compliment, as it’s ideal for kids whose understanding of the line between the real and the make-believe is still developing. Director Kim Selody makes the most of this adaptation for certain, and has led the actors over and over to surprisingly honest and real-feeling choices in this fantasy tale. There’s enough business and yahoo to be engaging and magical, but it’s still real-life enough that a crying tiny front-row citizen can be safely handed over to Granddad in the back row for cuddles and reassurance without spoiling the magic. This performance seems to have been quite an ongoing success, and it’s no wonder – I’d love to see them do more. When I asked Stanley if he enjoyed the show, he replied “Yes! Can we see it again? How about tomorrow?” Which probably tells you all you need to know. Darkness: Lights are on the entire time, except one brief blackout at the end. Loud/sudden noises: There are a variety of noises, but most of them are made by the children. Themes: Feelings, imagination, self-discovery, home furnishings. Seating: general admission, with most seating on the floor. You’ll be made to remove coats and then shoes in two stages, so dress accordingly. There are some proper chairs at the back for those of us who can’t sit on the floor for an hour; ask for one ahead of time if need be. Overall family-friendliness: High. There was a lot of music and noise to cover minor chattiness, and the cast and staff are friendly, helpful, and kid-positive. 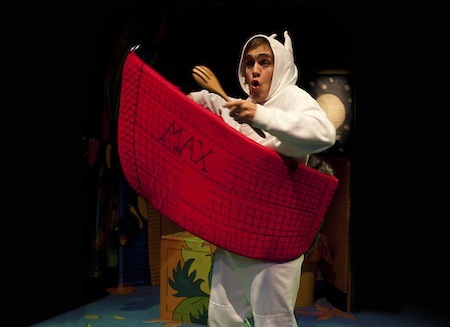 Where The Wild Things Are plays at Young People’s Theatre (165 Front St E) until 30 March. See the calendar for showtimes; public showtimes are 11am and 2pm on Saturdays and during March Break, 2pm Sundays, and a Saturday schedule, but the public is welcome to attend school performances, subject to availability.